The extraordinary quality of Yongzheng Guangzhou production for the court is exemplified here, with masterly painting coupled with faultless technical perfection. The surface is miraculously flat and even, free of flaws, and every colour has fired to perfection, which was rarely possible at Beijing at the time. Technically, painted enamels on metal in China do not get any better than this. The formalized floral design is as fine as any similar design produced during the reign at Beijing. Moreover, it is as substantially made as its Beijing equivalents, heavy in the hand and with an impressive underlying layer of enamel on the exterior. This bottle was clearly an attempt to prove to the emperor that southern enamelling could hold its own with its courtly counterpart, without any hint of apology. One other feature that demonstrates the bottle’s superior quality at the time it was made is the inner metal neck, which has been gilded as heavily as the rest of the exposed metalwork. 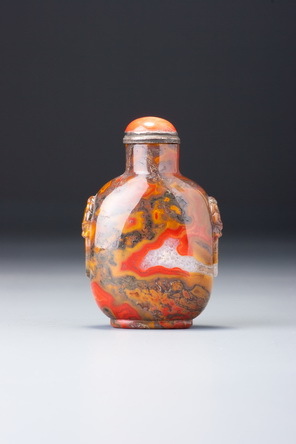 This metal inner neck is sometimes found on snuff bottles, but on the majority of Beijing wares was usually quite short, extending no more than a millimetre or two inside the bottle, whereas here it is a liner covering the entire inner neck to a depth of half a centimetre. This custom began at the palace with such bottles as Sale 4, lot 166, which has a deep inner neck liner, and it is possible that this Beijing feature was copied in the South at Guangzhou. 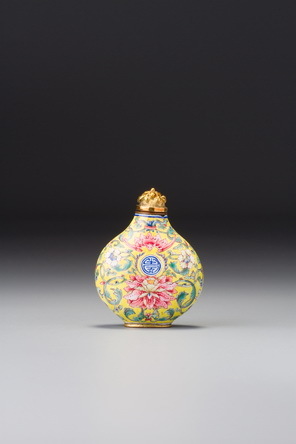 Not long after the first publication of this bottle from the Bloch Collection, several copies of it began to appear on the market bearing rather anomalous Beijing-style Qianlong reign marks in blue enamel. One was offered at Eldred’s, 23 August 2002, lot 273.